Whether you realized it already or not, health is wealth. We Pinoys tend to overeat and enjoy the holiday season to the hilt. Filipinos celebrate the longest Christmas season in the world. Decorations are already up on the first day of the "ber" month- September. Yes, pulis! The first day of September marks the start of the Christmas season in the Philippines. Parties and reunions are everywhere every week if not everyday leading up to Christmas Day and are usually extended till New Year’s Eve. And parties only mean one thing: Good food. Everybody looks forward to this time of the year when we can splurge on a leg of ham or a jamon de bola. If budgets are tight, Pinoys still feast on Lechon Kawali or Crispy Pata. For well-off families, lechon never ceases to appear on the table. The same with bigger families, since it is considered de rigueur for parties. With all these holiday delicacies, it is a real challenge to keep track of the calories you consume and stay on that diet you’ve been trying so hard to follow all year. You convince yourself that this is just a once-in-a-year event and a slice of that tasty ham or a bite of that crispy, succulent lechon skin won’t do any harm. Before you know it, you'll realize you’ve had too much and all that’s left is the taste of guilt plus those extra pounds. It is a good thing that Fisher Farm came up with delicious products good enough for our traditional salo-salo (get-together). This holiday season, Fisher Farms Inc., a world-class aquaculture food processor and the largest supplier of farm-raised milkfish in the country, lets you indulge without the guilt with its Gourmet Baked Rellenong Bangus. Created by celebrity chef and food expert Reggie Aspiras, this delicious creation is a healthy alternative to the fatty dishes often served during the Noche Buena (Christmas eve). 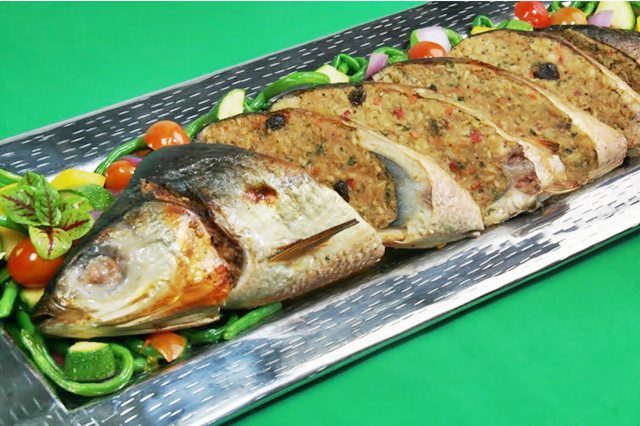 The whole bangus (milkfish) is stuffed with a savory filling of fish, sweet potato, bangus belly, shrimp and other premium and special ingredients that give a holiday twist to this traditional dish. Juicy and flavorful but not cloying like its fried counterparts, the Gourmet Baked Rellenong Bangus makes any celebration merry and healthy. Unlike the traditional rellenong bangus, this is baked and not fried, which cuts down considerably on the fat content without sacrificing flavor. The relleno comes in three generous sizes to suit the Filipino family: 800-grams, 1.1 kilos, and 1.3 kilos. With bangus this big, you can definitely share the feast but not the fat. As the country’s leading aquaculture processor and exporter, Fisher Farms grows its milkfish in the pristine seawaters of Pangasinan in fish cages, resulting to sweeter, more flavorful, firmer and cleaner fish. Only high-protein feeds are given to farmed fish to produce high-quality fish meat. Fisher Farms’ Gourmet Baked Rellenong Bangus is available in select supermarkets in Metro Manila and in select provinces around the country. For more details about Fisher Farms, visit fisherfarms.ph. Visit its Facebook (fisherfarmsinc), Twitter(@fisherfarmsph) and Instagram (@fisherfarmsph) for updates.